Pack Verification empowers your staff to pick, pack and ship orders, while validating the line items and quantities against actual order details. The results are faster processing, fewer errors and complete visibility. TriLogix's Pack & Ship solution is designed based on the belief that an integrated logistics solution is a key asset in an ever-changing distribution and fulfillment business. BOL's; your distribution software can be the difference between increasing profits or fines, late fees and assessorial charges. TriLogix offers configurable Pack & Ship solutions that are scalable as your customer's needs change. Shipping a customer the wrong item or wrong quantity has a ripple effect through out your business. If your orders contain many lines, separating your pack verification process from shipping may help reduce bottlenecks. Alternatively, some businesses can maximize through-put by generating a shipping label at the pack station after closing each carton. Speed and efficiency can be gained in those cases by creating a single pick, pack and ship process.There are many factors to consider, including when to apply customer compliance UCC128 labels with "n of m" labeling. TriLogix's industry knowledge and experience with pick, pack and ship systems will help you deploy "best practices" in your distribution center. As each carton is packed, the item and packed quantities are verified and recorded in our database. This Carton Level Detail (CLD) is used to create customer compliant labels (UCC128), send ASN - 856/857's, and print packing lists. TriLogix also offers a browser-based tool which provides real-time visibility of all order information, including orders packed and shipped, the tracking number of each carton and the exact items inside each box, and the expected delivery date of the order. Users can even track each carton in real time.Using a standard browser, any approved user in Customer Service, Sales, Distribution, Management...even your Customers; will have true Enterprise Visibility of the status of each order, including the contents of each carton. TriLogix's standard functionality allows your business to shine. Whether you need to capture lot numbers, serial number or expiration dates, Pack can be configured to capture the data that is critical to your business. 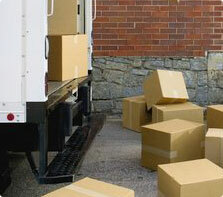 Do you allow partial shipments or over shipments? Do your users prefer to use a bar code scanner, keyboard, mouse or even touch screen technology? Your pack verification preferences can be configured to match your business, not the other way around. TriLogix's Label and Reporting engine generates carrier-required shipping outputs, such as carrier compliance shipping labels, international labels, international and export documentation (Commercial Invoice, Certificate of Origin, NAFTA, Shipper's Export Declaration and more). Other outputs include pick tickets, packing slips and daily reports. The form generator and reporting engine may also be used to create Customer Compliance labels, such as ASN/UCC128's, LPN's, internal labels and pallet tags.